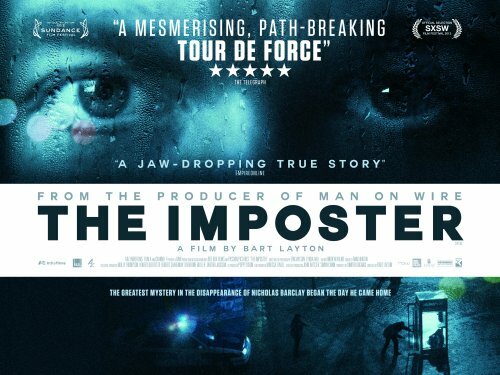 Based on a remarkable true story, 'The Imposter', directed by Bart Layton, is a gripping – and by turns chilling and morbidly fascinating – documentary about notorious identity thief Frédéric Bourdin, and one particularly audacious case of impersonation that took place in 1997. The case in question was that of Nicholas Barclay, a young boy who tragically disappeared from his home in San Antonio, Texas in 1994, to resurface ‘miraculously’ three years later in Spain – a happy circumstance fabricated entirely by Bourdin with shocking efficiency. Using a brilliant combination of poignant, grainy home video footage, dramatised re-enactments and contemporary interviews with Bourdin, the Barclay family and various authorities involved in the case, Layton weaves a tense, engrossing narrative that blurs the lines between genres – at times feeling more like a forensic drama or a thriller than a straight documentary. Perhaps even more intriguing than the bizarre sequence of events surrounding the case itself are the underlying psychological questions raised. Bourdin explains his actions in candid terms, straight to camera, often with disconcerting charm and charisma. What motivates him to assume the identities of others? And more disturbingly, why were so many people willing to accept his lies? Layton presents this incredible story in a sophisticated, textured way that leaves you with a genuine sense of incredulity and suspense throughout. Conflicting testimony, masterfully timed red herrings and the atmospheric dramatised sequences all come together to make a film that’s riveting from start to finish, with a slightly unsettling aftertaste. 'The Imposter' will be released in UK cinemas on August 24th, through Revolver.